Product categories of Battery Smart Pulse Charging Restorer, we are specialized manufacturers from China, Battery Smart Pulse Charging Restorer, Battery Charger Restorer suppliers/factory, wholesale high-quality products of Smart Battery Charger R & D and manufacturing, we have the perfect after-sales service and technical support. Look forward to your cooperation! Plate non-damaged desulfator with Smart pulse,Simple and Safe,Save your money, time and worry. Most of Electric vehicle use lead-acid battery bank(12V /6V /8V cells packed in Series)as the power source. The design lifespan of battery is 2~3 years, but actually the battery is usually failure after 6~12 months used which State-Of-Capacity gradually decline and even some scraped. Through analysis by cutting a large number of failure batteries, the battery water loss and sulfation is quite prominent. Such as the phenomenon of battery sulfation and dehydration can be effectively inhibited to prolong the service life greatly up to 2 times. Battery Smart Pulse Charging Restorer is a new generation of high-tech products developed specifically for restoring Electric vehicle battery and UPS power system when it is charging every time, it utilizes the energy from the charger, generating electronic smart pulse with special frequency to be resonance with the thick lead sulfate crystals in battery charging process. Under the disturbance by the specific frequency pulse, the recrystallization of lead sulfate can be prevented effectively. Battery Charger And Restorer 2-in-1 is a multiple-stage charger with smart pulse maintenance ability. This innovative, state-of-the-art battery restorer smartly knows how to restore battery in charging process, Unlike other common chargers on the market, you don't need to select the battery type. It works smartly on any type of 12/24/36/48/60/72-Volt lead-acid battery – VRLA, AGM and flooded. 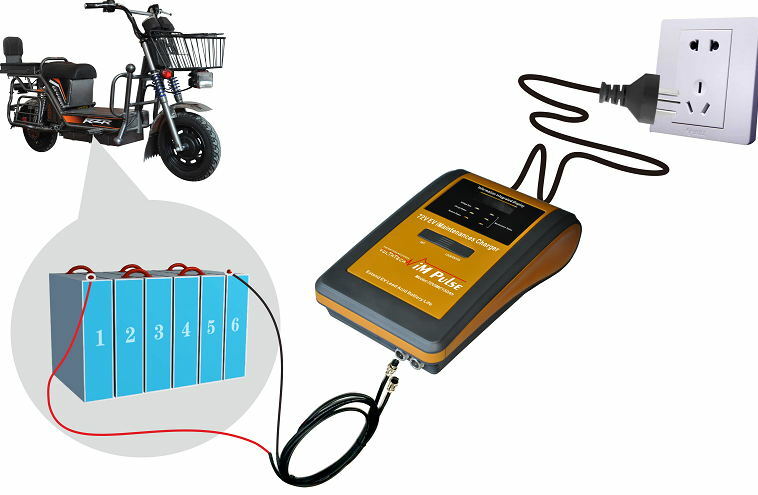 Proprietary algorithms combined with microprocessor & IC controlled technology measure the battery's voltage and current to automatically determine and deliver the precise pulse frequency and duty cycle based on the size and condition of the individual battery. It is more than a common pulse charger and desulfator. During the restorative battery charging cycle, VoltaTech's patented, optimized frequency pulsing and smartly changeable duty cycle constantly work to minimize and reduce battery sulfation and internal resistance. By reducing the size and number of lead sulfate deposits on the battery plates- the No.1 cause of battery failures, increase capacity and release energy to keep battery in new conditions, your battery will charge deeper, maintain greater reserve capacity and last longer service lifespan– up to 2 times longer.